actually not since the 9 day trip in June ! So, a break of some settled weather saw me on the phone to Laurie, who I figured might be willing crew. We agreed to overnight on the boat for an early start on the Sat morning - then run down to Watchet and Minehead - maybe going in to Watchet overnight and returning Sun. The start of many a trip in Lena - the slip at Uphill yard, near the top of a very large tide. After a night at a crazy angle on the mud we were both just glad to be level again by 5.30 am - but the day seemed ok - with the forecasted 3-4 southerly. I didn't really think this trip would be anything more than any other of my trips down here - in a way it was intended as a simple intoductory all day out sail for Laurie, who previously had only been out sailing once, around the bay for an hour last season. The wether seemed kindish and we had had fairly mild winds for a couple of days. By the time we were out past Steep Holm - we had a nice S to SE breeze - which was just right to give us 5 kts with full sail up and a gentle heel. The day was far from good visibilty though - with thunder predicted for Sun - it was a strange humid day. Half way there we may as well have been mid Pacific for what we could see. Laurie gets a good chance at the helm in near perfect sailing conditions - quite a difference to his usual canal boat. Must be odd not to have a toepath ! Somehow though, it turned into one of the best sails I've had in Lena and made up for all the effort of keeping a boat on the water. An 'almost perfect' sailing day. The heavy haze made me realise how much I appreciate the Garmin - but I've learned a lot from Ian lately, on the extended cruises. He never sailed with a gps, so knows his stuff on visual pilotage. I'm getting better at missing buoys ! We anchored for an hour in about 5m at Blue Anchor whilst making some egg sandwiches. We had about an hour before the local LW at Watchet. The Easterly was really picking up here a bit - so put a reef in the main. A bit cautious really - but partly because I'd not reefed the main since fitting my new downhaul, so wanted to check 'on the water' it would set ok. I've got some further ideas for simplifying the slab reefing. The return was spoiled a bit by the wind stiffening and backing E a bit - so we had to motor for a bit with the wind on our nose - but by the time the flood had set in earnest, the wind died a death, leaving us belting along with a 4 kt tide, a full flat main and a tickover on the engine for a bit of steerage. We caught a bit of breeze just past Steep Holm - so dipped the engine and dropped out the reef, then managed to sail into a gloriously still Weston Bay, on a hot balmy sunny Saturday evening. 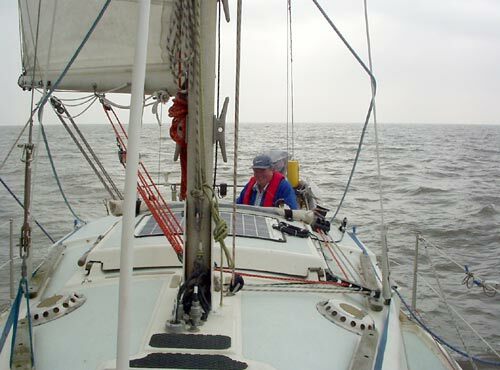 Nearly made it to Axe approach under sail - but it became a dead flat calm once into the bay. 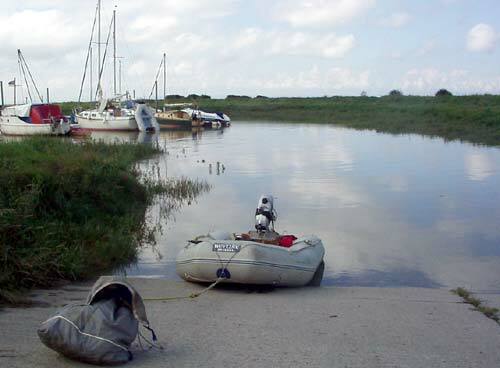 Everyone seemed to be out and about fiddling with their boats - and it was a 12.6 m tide to boot. Pottered in on the engine about 5pm - we were just right for the Axe at 5.30 - 2 hrs before HW - enough time to get the sorted out without any rush to get back up the the Uphill slip. Missed the mooring again - but the river was going as fast as I've ever seen it. Maybe because it was just at the peak of the flow, or the fact it was a 12.5 m tide. I did my reversing trick - and it worked again ok. Bit of a knack and very hard on the tiller ! But trying to turn her in the river at that rate is difficult. Makes marina berths seem a doddle ! A very pleasant day - stuck in between all this rubbish weather. We were lucky to grab it as we did.